Originally a sewage pumping station (built in 1891) this interesting museum features some of the largest steam beam engines in Britain. The engines were built in the late 19th century, and can be seen working at specified weekends. There are also an exhibits on the history and technology of hygiene, toilets and water. An 84 ton steam shovel is another one of the museum's working exhibits, along with a passenger-carrying narrow gauge railway. This beautiful three-storey Queen Anne style house dates from 1709. Its restored period rooms contrast Georgian elegance with Victorian comfort. Period rooms include a drawing room, music room, nursery and authentic Victorian kitchen. 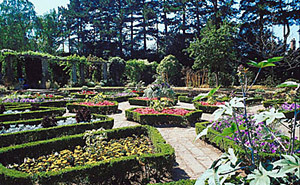 The grounds contain two acres of walled botanical style gardens. The city's main concert centre. The building is commemorated to Simon de Montfort, an Earl of Leicester during the 13th century. He was party to the barons' revolt against Henry III, which was instrumental in creating the first English parliament. On of the finest medieval buildings in the city. 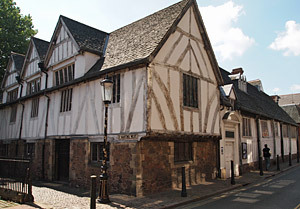 The Guildhall was built around 1340 for the Guild of Corpus Christi and consisting of a hall, mayor's parlour, library and cells. It was used as the meeting place of the mayor and town corporation from the 15th to the 19th centuries and was once home to Leicester's first police force. Today it incorporates a small museum and a library, first recorded in 1587. Across the road is Wygston's House, a part timber-framed house and one of the oldest in the city, which currently houses displays of crafts, fashion and textiles. 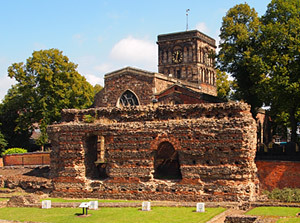 The Jewry Wall once formed part of a Roman complex which included a public bath and shops. The site has been excavated, and the exposed wall and building foundations are visible to the public, at the north side of St Nicholas Circle. The on-site museum displays Roman finds from the site, including some impressive Roman mosaics and paintings, in addition to relics from other parts of the city. 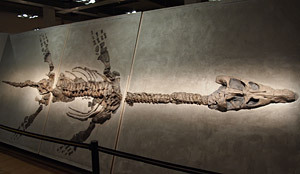 The ground floor has exhibits on Egyptology, archeology and natural history, including an impressive collection of local fossils and prehistoric dinosaur bones from nearby quarries. The gallery contains English paintings, modern art, ceramics and sculpture. Opened in 2001, the exciting National Space Centre provides six interactive hands-on galleries ideal for children to explore. Includes a 32 metre rocket tower, domed Space Theatre and a lunar base. Explore the universe through science, take the astronaut fitness tests or experience a Space flight with a 3D simulated ride. 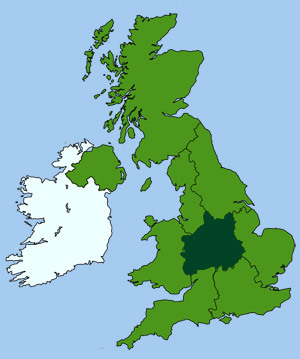 Presents the story of Leicestershire's social history from 1500 onwards. Exhibits include a life-size Victorian street scene. 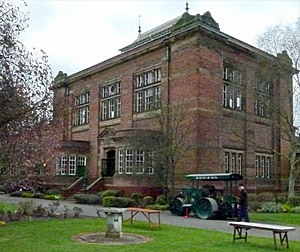 It also contains a museum tracing the history of the Leicestershire Regiment. The record office holds heritage photographs, electoral registers, old newspapers and film and audio archives, all of which can be accessed to study and trace local history. Set in the 16-acre landscaped grounds of four houses, currently used as a student residence for the University of Leicester. The grounds contain a wide variety of plants in various settings, including rock, water and sunken gardens. The gardens support a variety of mature trees, herbaceous borders, tropical glasshouses, plus they hold the national collections of aubrietia, hardy fuchsias, skimmia and Lawson cypress.